- N°24 bott. bordolesi of Chianti Classico DOCG 2019 produced from the row adopted with 18 months of aging or n°20 bott. aged 30 months, or 16 bott. aged 42 months. - 3 bott. 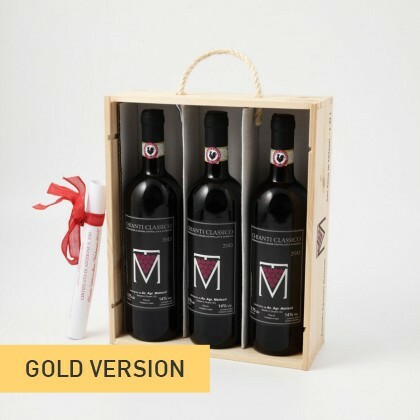 of Chianti Classico DOCG 2016in a gift box (with Gold Version). - 10% off for a lunch at the trattoria "La Grotta della Rana". 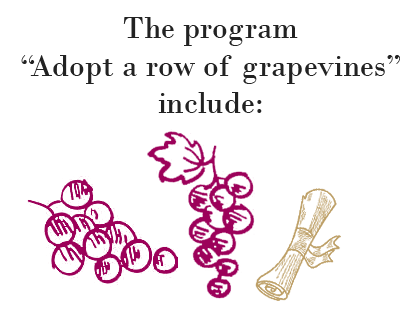 - Constant updates on processing, from harvest to bottling. - Personalization of the label of the bottles of the thread adopted. Imagine tasting a wine of great quality, a real Chianti Classico DOCG that you helped to grow! Adopt one of our rows and create a unique experience to experience with transport and passion.